I am just back from a speaking engagement in Puerto Rico, where I had the chance to visit with great friends and have some delicious meals! But…you’ll have to wait for that, as it deserves a juicier post than I have time for (secrets of Kendra’s delicious grilled lamb coming soon to this blog!). 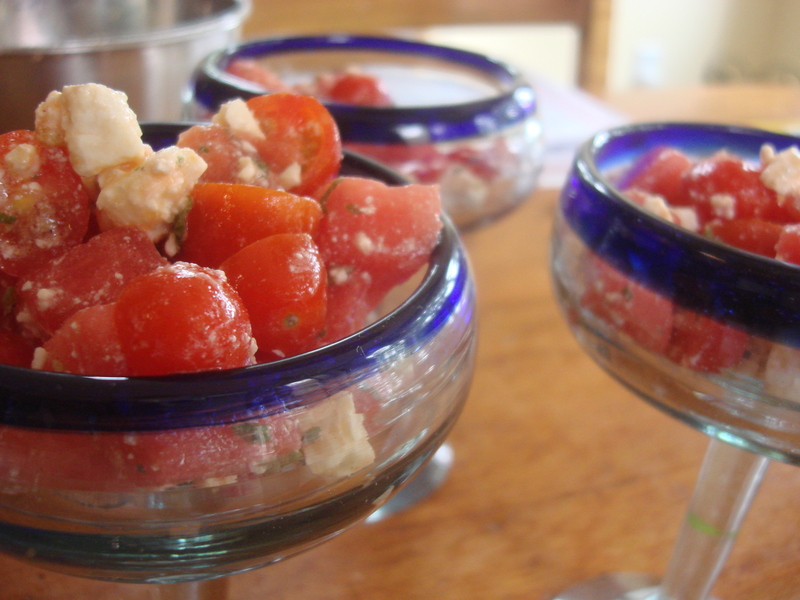 Watermelon and Feta go so well together and so well with tomatoes! However, rather than leave you high and dry, here is a bright new salad to entertain you. It takes minutes to prepare, and — if Dr. Oz is to be believed — the combination of watermelon and a bit of balsamic is a powerful enzyme that will aid in digestion and perhaps weight loss. So here it is: a fast and refreshing salad that use seasonal fruits and vegetables at their peak. And it’s pretty gorgeous too! Serving suggestion: Mexican-style margarita glasses! 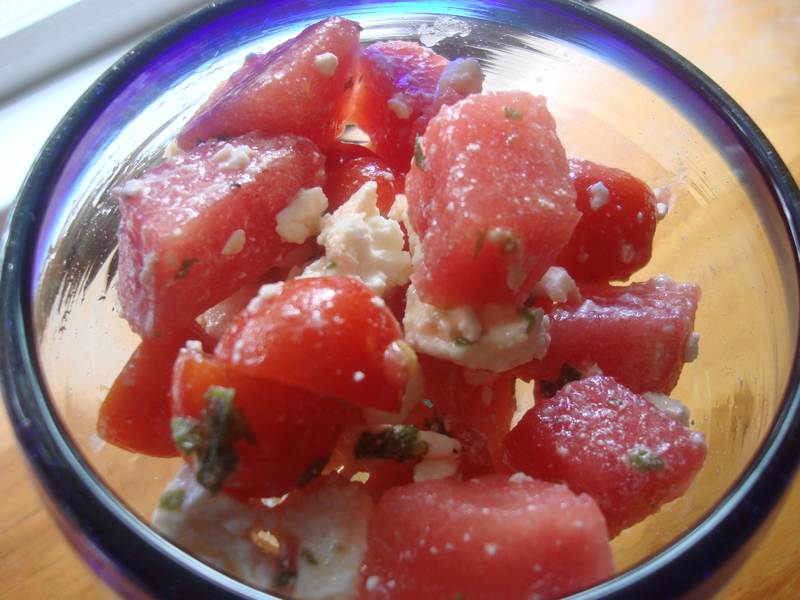 In a larger bowl, place watermelon, tomato, feta and mint. Pour dressing over. Stir in mint. Combine all gently and serve. 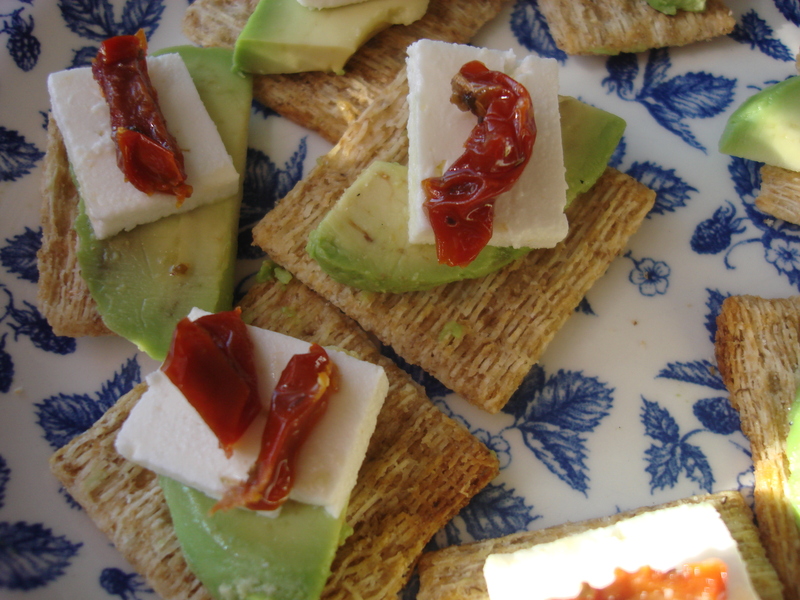 Feta, Avocado and Sun-Dried Tomato Snacks — Use ‘Em While Ya Got ‘Em! I’m in a Use-It-Up frenzy at the moment; bought more fresh food than Leandro and I could consume during a week in which we were unexpectedly invited to dinner at other people’s houses and even if I could afford the waste, I have a really hard time throwing out food. (For more on the food we throw away visit Jonathan Bloom at Wasted Food; or the E.P.A. — where you’ll find out that Americans generate 34 million tons of food waste each year; or this NYTimes article from 2008 which says “As it turns out, Americans waste an astounding amount of food — an estimated 27 percent of the food available for consumption, according to a government study” ). So, no real recipe today, but a serving suggestion of flavors and textures that worked well in a “scrappy” snack…horrid pun intended. I took half an avocado left over from the previous day, some slices of feta that needed using up, and some sun-dried tomatoes in oil that have been lurking in my fridge. 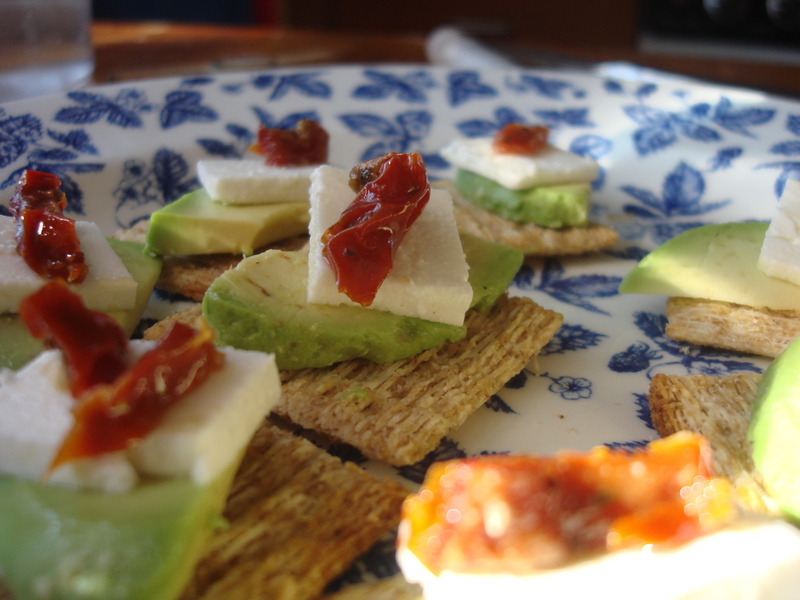 I just sliced fairly thin, laid them on woven wheat crackers and called it a light lunch. It was delicious and satisfying and effectively utilized my natural resources! Pretty too, don’tcha think? 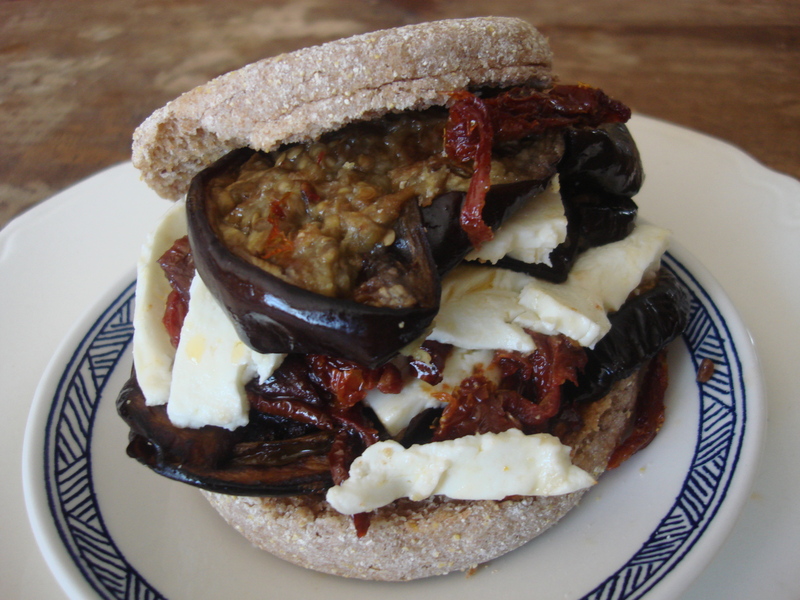 Roasted eggplant and friends on whole wheat English muffin. Don't worry about the verticality; it smushes down to a reasonable, biteable size. during what remains of their precious lunch hour. Yeah your takeaway order may be tasty and juicy, but do you really know what you’re eating? Yeah, a $6.99 lunch special may seem like a good deal, but does it tell you how special and important you are, the way a home-cooked meal does? Of course not. So at least once this week, try to make yourself a home-cooked lunch that gives you a nutritional hug (or make enough of it for dinner that you have leftovers the next day). So please, please, please…show yourself some love and try this really, really, really easy and delicious sandwich/wrap thing really soon. You can skip the bread if you are watching carbs! When the eggplant is done, place a layer of rounds on your chosen bread. 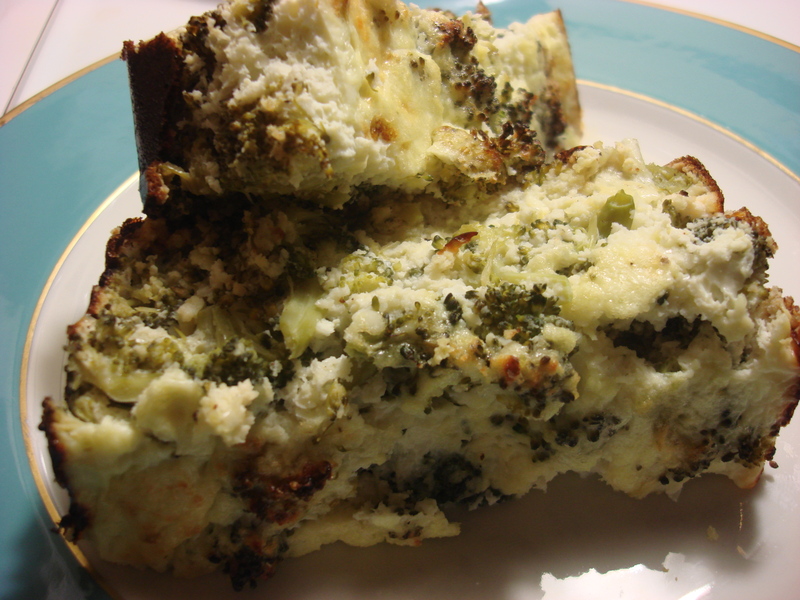 Top with feta and sundried tomatoes (and herbs, if desired). 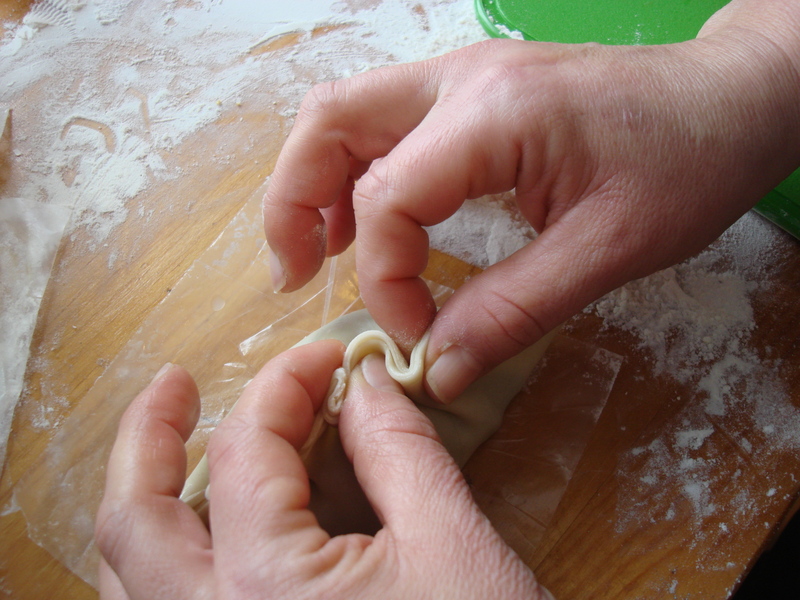 Roll up, if using a wrap-style bread. Toast for a few minutes in a toaster oven or under the broiler and serve (reheats well with a blast in the office microwave). *Notes: if you have time, sprinkle the slices with a pinch or two of salt, put in a colander and put a weighted bowl on top to squeeze out extra moisture – it becomes less absorbent that way – 15-30 minutes. This step is not really necessary with really tight-skinned, firm, fresh eggplant). I do a lot of eggplant at a time and either eat it this way all week, or strip the rounds of peel and stir into hummous or just eat it out of the fridge when I need a snack. Can be chopped and added to red sauce for pasta! You can also substitute other roasted veg. I love eggs, I love broccoli and I love cheese. They are so flexible and useful that they are natural convenience foods and I usually have all of the above in my fridge at any given moment. 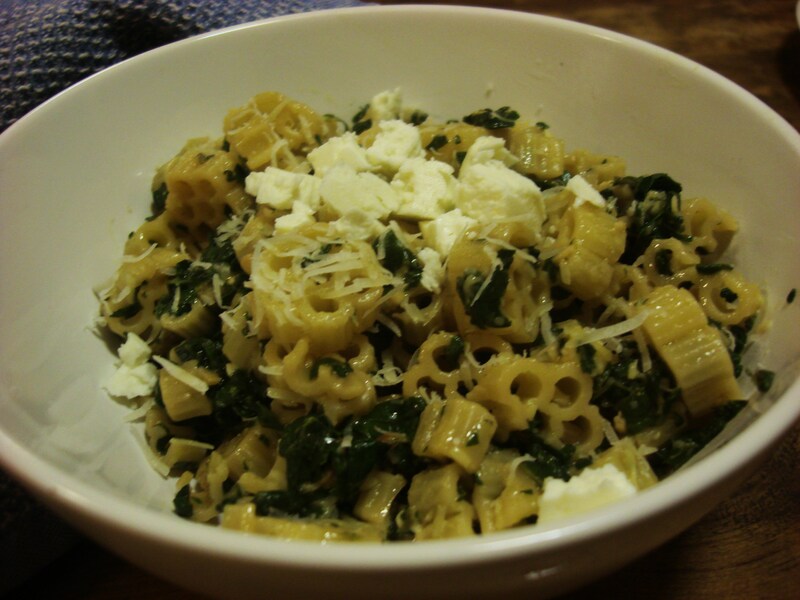 Like today, when I got a craving for a simple dinner with some charm. 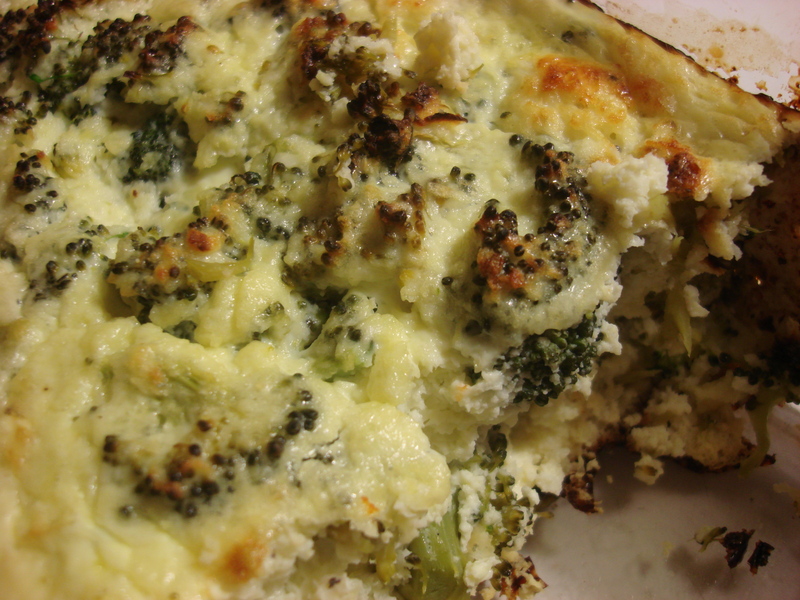 Quiche would’ve been perfect, except that the crust is a big pain, and adds more dough than I really want after a long winter of indolence. Then I remembered a Vegetarian Times recipe that eliminated the crust. I thought, “Hey! Why didn’t I think of that?” and adapted it to what I had in the house. Fifteen minutes of prep (and about 40 minutes in the oven) yielded a tasty and light combo of my favorite things. It was cozy out of the oven, but crumbly to cut proper slices. I will have more tomorrow morning for breakfast — quite possibly cold. My son is demonstrating great interest, so we’ll see if we can tempt him into giving it a try, ’cause it has potential to be good breakfast food for eating in the car (heavy sigh). If not, well I have the leftover yolks mixed with a bit of water and stored in fridge for scrambled eggs for his breakfast. Preheat oven to 425°. Grease a 9”x5” baking pan (you will put it in the oven to warm up a few minutes before pouring in the egg mixture). Toss broccoli with oil in a bowl. Put onions and garlic for a spin in the food processor until they are minced. Then add the feta and process until creamy. Add eggs and egg whites* and process until smooth. Crack a bit of pepper over it. 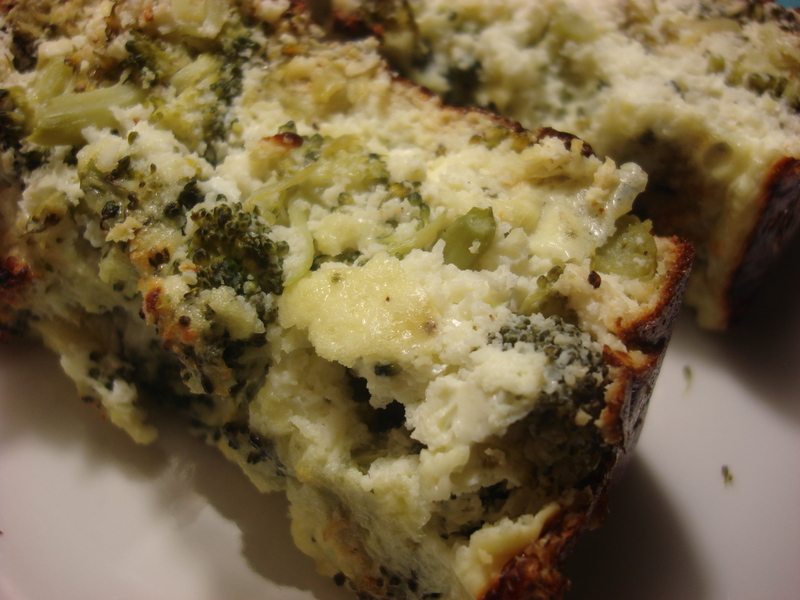 Remove warmed pan from oven, add broccoli, then pour egg mixture over, stirring to mix. Cook about 35 minutes (40 if using a glass baking dish) or until the top is light brown and a tester inserted comes out clean. *To separate whites from yolks, crack the eggs and gently pass the yolk from one half to the other, allowing the whites to drain into the bowl. Save the yolks for another purpose by mixing with water (just a bit) and storing tightly sealed in the fridge overnight.